President Barack Obama is trying to take the scalpel approach to cutting the federal budget rather than the machete or butcher knife that Michelle Bachman, Sarah Palin, and Rand Paul advocate. These Tea Party activists want to cut essential government services, where the major casualty is the baby as well as the bath water. But when it comes to walking the walk when on the floor of the House or Senate, many Republicans back off from what they said on the campaign stump or on Fox news. They go after smaller targets, such as National Public Radio (NPR) and the Public Broadcasting System (PBS). Their contention is that these are left-leaning organizations that don’t promote a balanced view of a bi-partisan government. Progressives have accumulated considerable data demonstrating that both NPR and PBS have essentially the same number of conservative guests as progressive ones. Even if that was true, I would agree with conservatives that these twin broadcast outlets have a liberal slant to them. If you look for synonyms for liberal in an English thesaurus, you’ll find “generous,” which is quite descriptive when it comes to the views that many liberals take about the less fortunate among us. Liberals are more likely to want to help rather than blame the victim. While I know that there are greater NPR and PBS aficionados than me, I don’t believe that I’ve ever heard a “blame the victim” story on either of these outlets. On the other hand, it wouldn’t be Fox News if an hour went by without someone in need being castigated for being lazy, unmotivated, or a societal sponge. So, if compassion and empathy are barometers (and they are to practicing liberals), then NPR and PBS have to plead guilty. It is with regret that I state the obvious: compassion and empathy do not reflect balanced government policy. In fact, in many ways these values are, regrettably, anathema to Republicans. But there are other words that are synonyms for liberal under the category of “open-minded.” They include broadminded, freethinking, tolerant, and even laissez-faire. This is because, in the truest sense, liberals are comfortable with free thought and open discussion. If Republicans accepted these values, then every night, Jon Stewart would be left to say, “I got nothing.” But many Republicans not only practice a lack of tolerance, they almost define themselves as not having it. As I have previously stated, this is not the case with all Republicans and certainly did not define the GOP in years past. To the extent that NPR and PBS attempt to provide more than one side of a story, in fact often more than two sides, they are engaging in liberal, open-minded thinking. It’s a shame that engaging in rational thinking makes an institution more partial to one political party than another, but that is indeed the case. When Republicans talk about eliminating federal subsidies to NPR or PBS, they’re not talking big bucks. 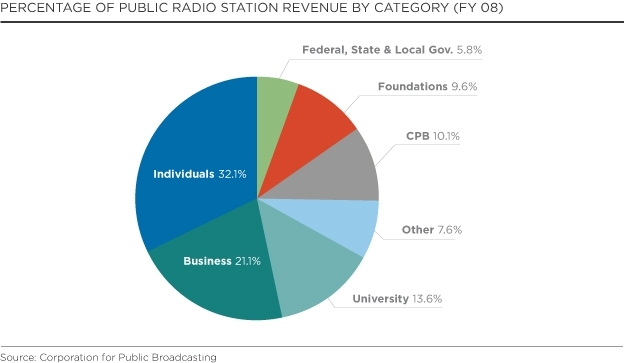 NPR receives slightly more than 10% of its funding from the Corporation for Public Broadcasting (quasi-public) and another 6% in direct federal funding. The funds are not given directly to NPR; rather they go to the 797 public radio stations spread about the nation. Total revenue in 2009 was $164 million, making the combination of federal funding slightly over $25 million. PBS has 354 member stations, and the president’s proposed budget for FY 2012 is $451 million. This is less than half of PBS’s total revenue. We’re familiar with pledge weeks on PBS. Few people are happy about them, except perhaps the makers of TiVo, who give us the capacity to pretend that pledge weeks don’t exist. Americans give billions of dollars to a variety of causes, including health care, education, disaster relief and environmental projects. We often hear that certain issues should not be partisan. Health care is a service that is a basic human right and should not be subject to partisan bickering. There is no Democratic or Republican treatment of cancer. The fact that we have the Susan B. Komen Foundation and many others similar to it is simply an admission that the government is not doing its job in sponsoring necessary research and treatment. When it comes to the airwaves, Rush Limbaugh is not paid by the government. While many see the gap between his “Excellent in Broadcasting Network” and NPR as policy related, it’s really that Limbaugh is an entertainer who feasts on an ill-informed public; NPR is an agency for informing the public. But that sort of reasoning has an outcome of putting progressive policies in a positive light. So, I’m willing to contribute more to NPR, and also to pay the necessary taxes for government to cover the costs of human and economic rights, but I don’t like contributing to medical or educational causes that are not necessary in other countries, because they are the mandate of the government. I would not suggest that progressives lie back and idly let federal subsidies to NPR and PBS disappear. However, I think that it would be wise for progressives to support policies that that let the government off the hook for these subsidies only when they properly meet other essential human rights needs. Summary: Empower the government to fulfill its obligation to promote the general welfare of the American people, providing full funding for programs such as health care and education. Then individuals will be largely freed from making contributions in these fields and will have plenty of discretionary funds to support preferences such as NPR and PBS.